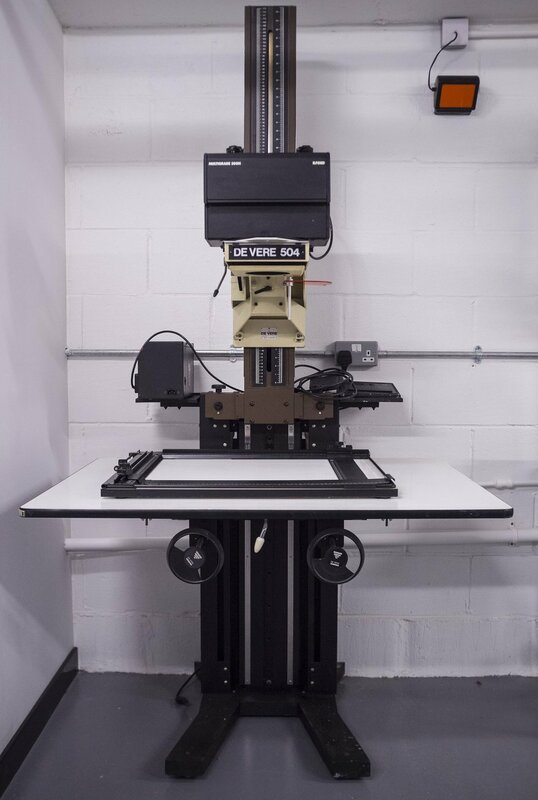 Our De Vere 504 floor standing enlarger probably dates from the late 1980s and is equipped with an Ilford 500H multi-contrast head. This means that there is no need for fiddly gels, just dial the contrast filter setting into the control panel and away you go. Complex dodging/burning sequences can even be programmed into the timer memory. The halogen soft-boxes create a beautiful diffused light source somewhere between tungsten and cold cathode heads. We have a range of lenses and carriers that enable the printing of negatives from 35mm to 5 x 4. Although we haven't tried yet, it should be possible to produce prints up to 36 inches wide! darkroom is immensely grateful to Nadav Kander for the generous loan of this equipment. While you are printing on this enlarger, just imagine the exquisite images that have been created on it in the past by this master photographer.